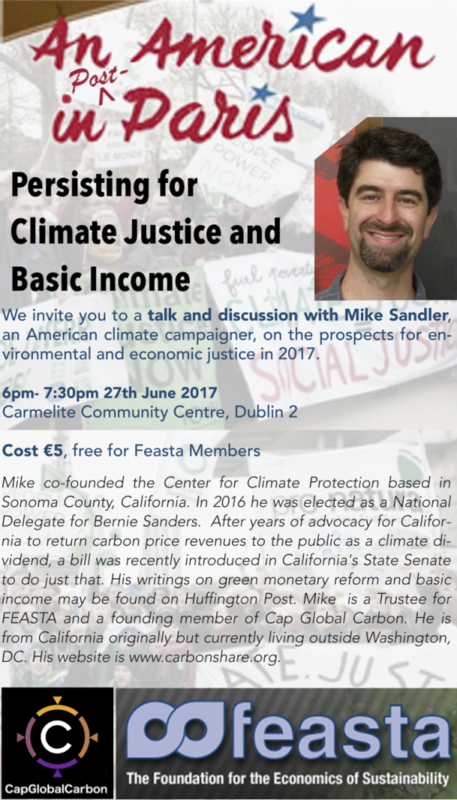 We invite you to a talk and discussion with Mike Sandler, an American climate campaigner on the prospects for environmental and economic justice in 2017. Mike Sandler co-founded the Center for Climate Protection based in Sonoma County, California. In 2016 he was elected as a National Delegate for Bernie Sanders. After years of advocacy for California to return carbon price revenues to the public as a climate dividend, a bill was recently introduced in California’s State Senate to do just that. His writings on green monetary reform and basic income may be found on Huffington Post. Mike is a Trustee for FEASTA and a founding member of Cap Global Carbon. He is from California originally but currently living outside Washington, DC. His website is www.carbonshare.org.